The Magellanic penguin population, too, has fluctuated significantly over the years. Along the South American coast numbers have been increasing at some sites and decreasing at others (1). Breeding pair numbers on the Falklands have fallen substantially over the past several decades, but we still don’t know why (2,3). We have researched the general breeding biology of Magellanics in the Falklands (4) as well as their population trends and their diet (2,3). In addition, the feeding areas of Magellanics have been studied during the breeding season (5) and in winter (6) using satellite telemetry. Comparative studies were conducted on Isla Martillo in the Beagle Channel, Argentina (7,8,9), on Isla de los Estados, Argentina (10), and on Islotas Punihuil in Chile, where Magellanic Penguins occur together with Humboldt Penguins (11,12,13,14). As a result, it has been suggested that mortality rates have increased due to commercial fishing activities (15) and pollution not only in the Falklands but also in the summer foraging and wintering areas along the South American coast (16). Based at least partly on our results, a corridor has been established along the coast of the Argentine province of Chubut, where shipping activities have been restricted in order to protect the main migration routes of Magellanic Penguins (PNA Ordenanza 13/98). 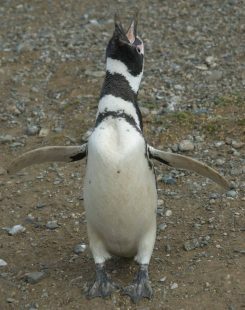 Currently, we are investigating in cooperation with Argentine colleagues from CONICET – CADIC, Ushuaia, the foraging ecology of Magellanic Penguins from Isla Martillo and Isla de los Estados with regard to sexual differences in their foraging behaviour and competition to other seabird species.